Get directions to our office Here. 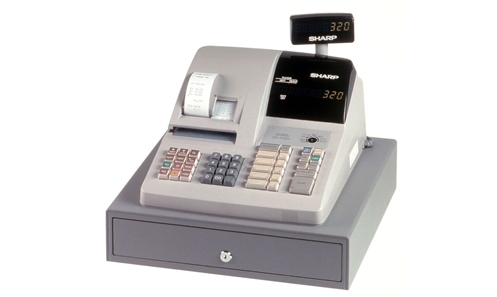 Designed for demanding retail and hospitality environments, the compact ER-A320 electronic cash register is the easy-to-use, powerful workhorse your small business needs. Rich in features, functionality and value, yet small in size, the ER-A320 gives your business an added advantage. Compact Cabinet Design – Make efficient use of valuable counter space while enhancing operations. 10 Standard Departments, Expandable to 40 – Efficiently categorize products by department, allowing you to track sales by product type, size, shelf location, etc. Up to 600 PLUs – Price Look-ups ensure price accuracy, ease of operation and increased customer throughput. 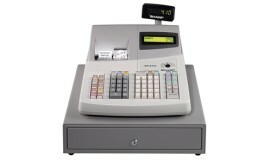 Built-in Calculator – It’s easy for an operator to do individual calculations without affecting sales data. Large LED Display – With its high visibility LED pop-up display, you’re assured of increased customer service. 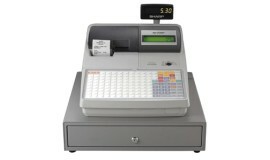 Single Line Validation – Operators can mark documents such as checks, gift certificates with critical date and time information. 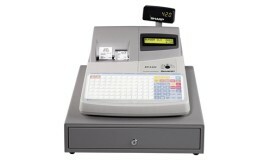 Heavy Duty Printer – Get high quality printing of receipts and reports at an amazingly fast 2.5 lines per second. 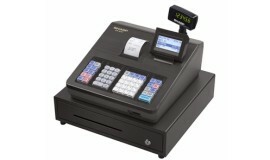 Our machines come with 90 warranty and programming help!